The appearance day of Sri Nithyananda Prabhu will be celebrated at ISKCON Scarborough coming Sunday - 17th February 2019. Sri Nityananda Prabhu, whose name literally means, “eternally blissful”, appeared around 1474 AD in the village of Ekachakra, near Mayapur, West Bengal. Lord Caitanya is the same Lord Krsna, and Lord Nityananda is Lord Balarama. Lord Nityananda fulfils all of Lord Caitanya's desires. In the same way that Lord Balaram is considered the original spiritual master, so is Sri Nityananda. Lord Caitanya is the most merciful incarnation of Lord Krsna, but Sri Nityananda, however, is even more merciful and compassionate than Lord Caitanya according to our Acaryas. No service is too small to go unnoticed by Sri Nityananda, and no sinner too bad not to qualify for his benedictions. Sri Nityananda gives the mercy to understand and approach Lord Caitanya, who in turn gives the mercy to approach Srimati Radharani, who blesses us with love of Krsna. 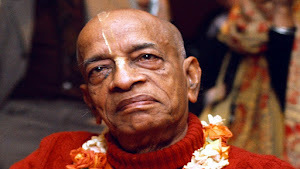 So the worship of Sri Nityananda is most important to Gaudiya Vaishnavas seeking the mercy of Radha-Krsna.